Betts, Edwin M., ed. Thomas Jefferson's Garden Book, 1766-1824: With Relevant Extracts from His Other Writings. Philadelphia: The American Philosophical Society, 1944 (reprint edition, Charlottesville: Thomas Jefferson Foundation, Inc., 1999). Betts, Edwin M., Hazlehurst Bolton Perkins, and Peter Hatch. Thomas Jefferson's Flower Garden at Monticello. Charlottesville: Thomas Jefferson Memorial Association and University Press of Virginia, 1986, 17-20. McLaughlin, Jack. Jefferson and Monticello: The Biography of a Builder. New York: Henry Holt & Co., 1988. 1. Betts, Garden Book, 17, 283 n2. 2. 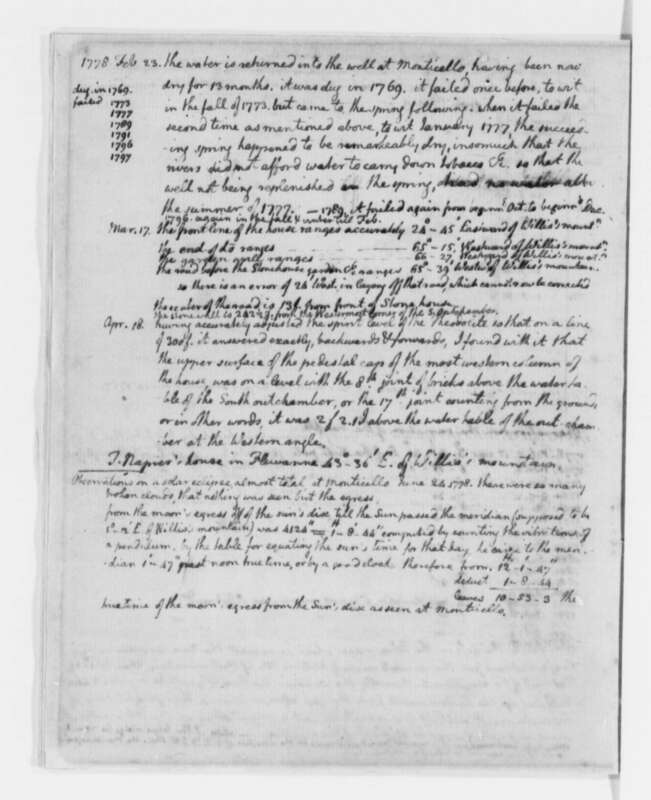 Thomas Jefferson, 1776-1818, Weather Record, Thomas Jefferson Papers, Library of Congress. Jefferson's notes concerning the water supply in the well are available online. Transcription available in Betts, Garden Book, 629. 3. 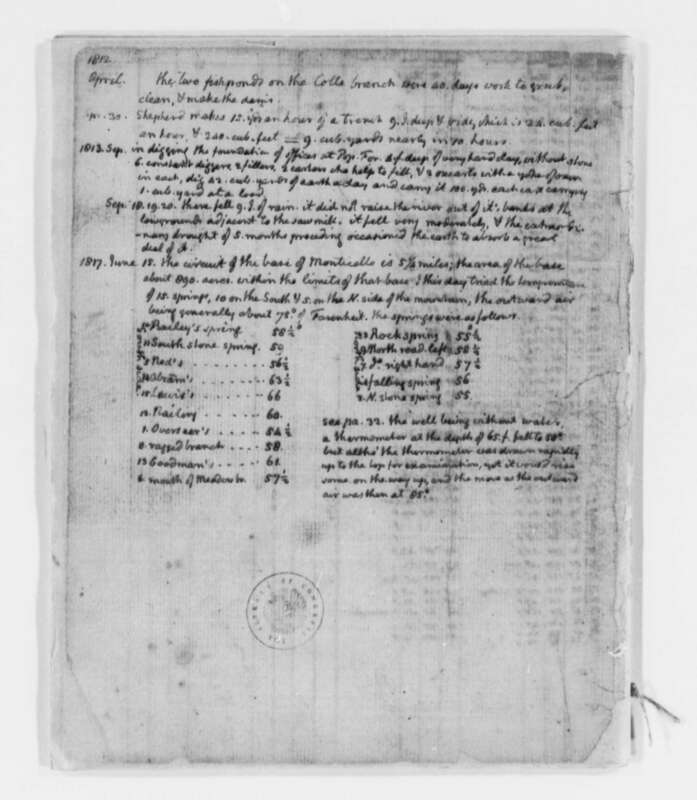 Weather Record, Thomas Jefferson Papers, Library of Congress. Jefferson's record of temperatures at Monticello's fifteen springs is available online. Transcription available in Betts, Garden Book, 630. 4. Weather Record, Thomas Jefferson Papers, Library of Congress. 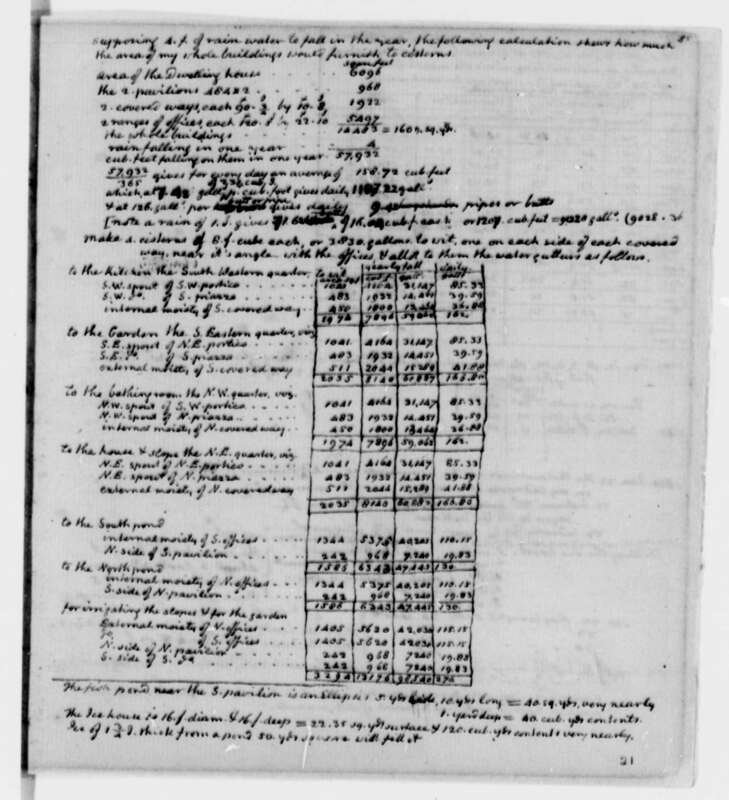 Jefferson's calculation on cisterns is available online. Transcription available in Betts, Garden Book, 630-31. 5. See Jefferson to James Dinsmore, November 7, 1808, Coolidge Collection of Thomas Jefferson Manuscripts, Massachusetts Historical Society. Transcription available at Founders Online. 6. See Jefferson to John Brockenbrough, June 4, 1823, Thomas Jefferson Papers, Library of Congress. Polygraph copy available online. Transcription available at Founders Online.